Although plenty of Juv fiction books star dogs, hardly any star cows. Undervalued author Nicholas Read attempts to right this with Saving Emily, a tale of a boy and a calf whose paths cross in an unexpected way. This book discusses the reality of modern animal faming, but skittish parents should not dismiss it as propaganda. All of the characters, including the ranchers, are multi-shaded individuals with their own reasons for behaving the way they do. Scenes of life on the ranch do include branding, tagging, and other inhumane practices visited upon cattle. I do wish the author had left out the (albeit brief) scene of the ranchers gelding the male calves. Not because this isn’t reality, but rather because it’s really skirting the line with touchy American parents, teachers, and librarians—particularly those in urban and suburban areas who aren’t exposed to the day-to-day activities of farm life. 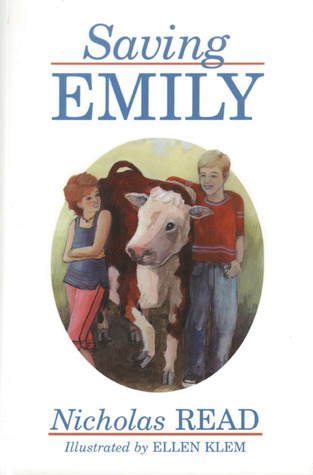 Saving Emily is a much-needed contribution to humane literature that explores a perspective little seen in animal stories—that of a farm animal. It is my hope that it receives a wider audience. With this in mind, I purchased this book for my library.